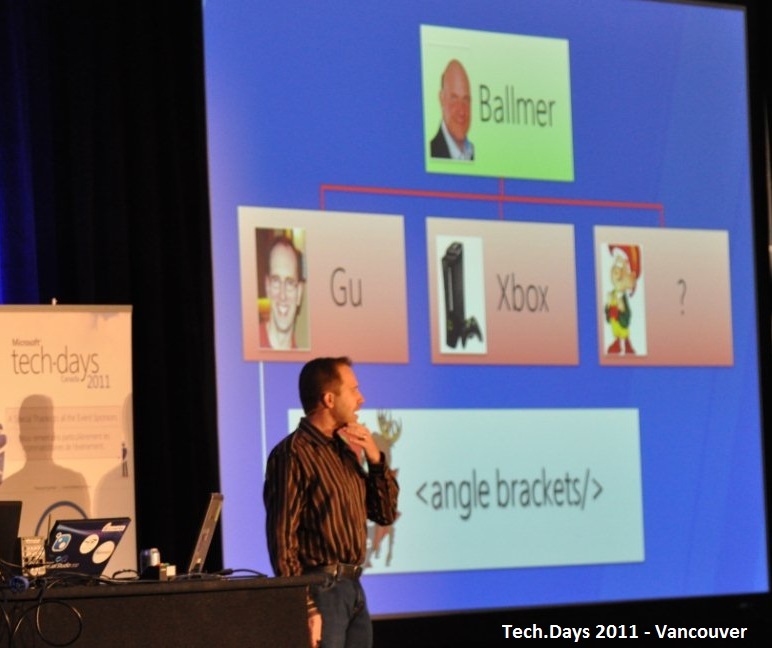 On November 15, 2011, Scott Hanselman presented in Tech.Days 2011 the highlights of the editor of Visual Studio 2011 Developer Preview, as well as a few of his own insights about new features in Windows 8, HTML5, Windows Phone, ASP.NET, MVC, and SignalR. 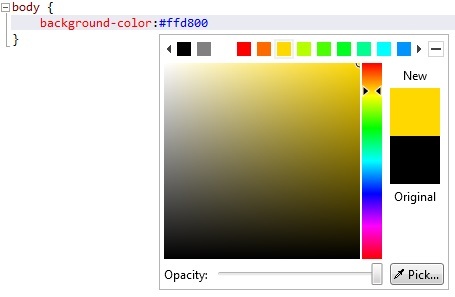 The background color property comes with the color picker popup. 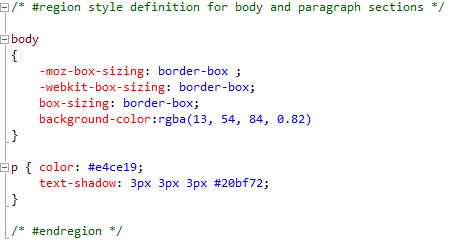 Region block can be created in the CSS editor. 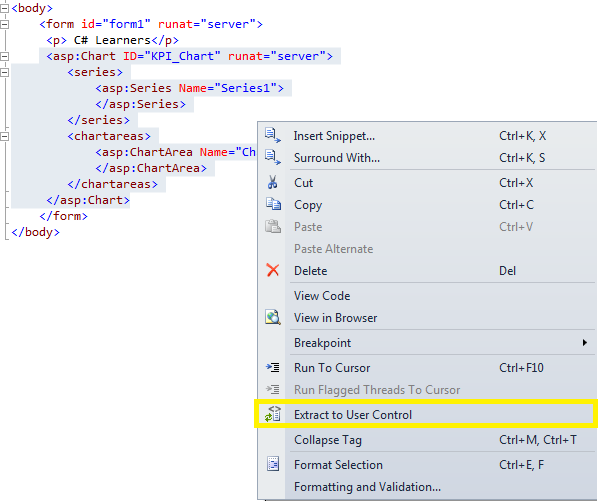 In the HTML editor you have an option called “Extract to User Control” that allows you to refactor your code and put the selected code in a user control. This post has been removed. Please email bryan.robinsons@gmail.com if you have any questions. a) Silverlight Browser Support: Silverlight currently only officially supports Internet Explorer, FireFox, Chrome and Safari. Support could be extended to Opera or other less prominent browsers. b) Operating System: Silverlight is currently limited in the Mobile space (No Symbian support yet) and in the Gaming Console space. c) CPU Architecture: Silverlight doesn’t support x64 CPUs, Mac G4 PowerBook CPUs, and a few other CPU architectures. At Mix10 Microsoft VP Scott Guthrie announced Silverlight Adoption rate is at 60% of all internet connected machines. In the future, we could hope to see Microsoft bundle Silverlight with Windows or add it as a super-duper-should-have update to Windows Machines. 1) No API for Drawing Shapes. 2) No API for Resizing & Rescaling. 3) No API for Clear, Copy & Crop methods. 4) No API for Conversion to various formats. 5) Performance issues that plague any “1 pixel, 1 read/write” approach. Using the OpenFileDialog and SaveFileDialog end-users can respectively grant read and write permissions for any file to a Silverlight Application. Developers would like to see these permissions persist after the application has been restarted. We can see in Silverlight 4 RTM that Full Screen, Webcam and Clipboard access already get persisted after application restart. So it is not unreasonable to hope this feature will be included in Silverlight. With PLINQ & TPL creating, debugging and maintaining multi core applications has been massively simplified on the .Net framework. With Silverlight supporting C# 4 and a majority on new .Net 4.0 features, it is possible we’ll see PLINQ and TPL in future Silverlight versions. That would allow Silverlight to have the best in-browser threading solution for any major programming platform. Microsoft has a great suite of Reporting and Analysis tools that are part of the SQL Server 2008 product group. As part of ASP.Net and winforms there are ReportViewer controls that allow to view, zoom, page and export from predefined RDLS reports. If this feature is implemented it would probably include a new Silverlight & WPF Report Viewer control as well as deep SQL Server Reporting Services integration. Windows 8 gives you the platform and tools to create rich app experiences where your customers focus on tasks that are important to them. Apps are at the center of the Windows 8 experience. They are alive with activity and vibrant content. Your customers immerse themselves in your full-screen, Metro style app allowing them to focus on their content rather than on the operating system. With Windows 8 you can leverage your existing skills and code assets to create great experiences for your customers. • .NET Developers can use XAML, C#, and Visual Basic to build beautiful Metro style apps. • Game developers can use the power of DirectX 11.1 to build amazing, immersive gaming experiences. • Driver developers can use the new, integrated Microsoft® Visual Studio® development environment to increase productivity. Windows 8 and its new WinRT native libraries can be targeted by C/C++ developers just as the age-old Win32 libraries could be. This has not really changed and there are certainly many applications such as complex games, device drivers, etc. that require the kind of low level control that C/C++ offer. On the other hand, for 99% of Metro Style Apps such as social media apps, productivity tools, and business apps, C++ is not the answer in Win8 any more than it has been for the last 10 years. 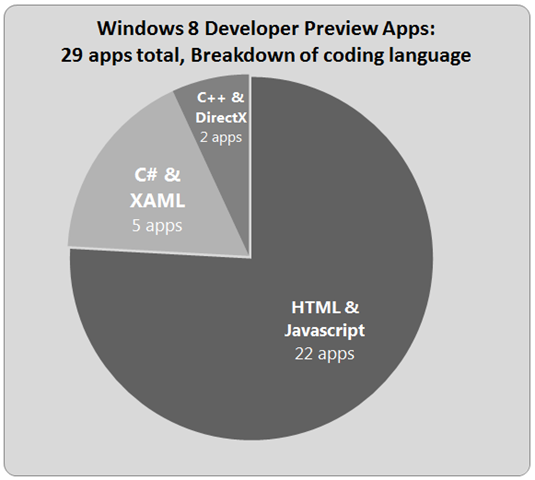 XAML/C# in Win 8 is the best option for the vast majority of Microsoft developers. 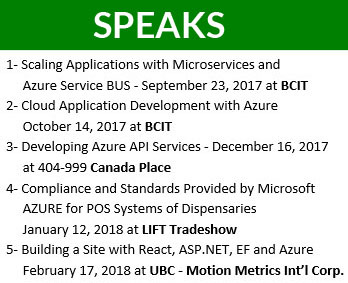 The Silverlight/WPF community can bring their skills forward, though they will need to learn new controls and new APIs for working with WinRT as opposed to WPF/SL. General .NET developers who have not yet done anything with XAML will have a somewhat larger learning curve, but XAML itself is a very mature UI platform at this point, so it should be pretty easy for these developers to find the resources they need to quickly get up to speed with this. 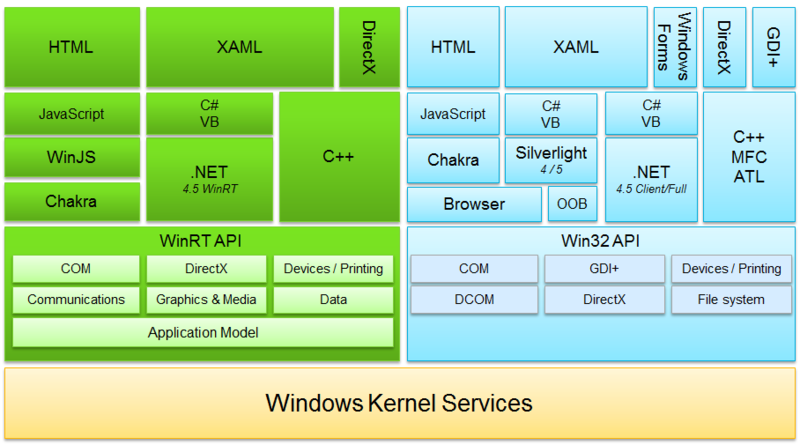 I expect this to be the most widely used technology stack for building WinRT applications. The .NET available to WinRT applications is best thought of as being like .NET on the Windows Phone. It is basically the Silverlight subset of .NET, plus a bunch of WinRT-specific features and capabilities. The differences between Silverlight and WinRT are a bit more dramatic than with WP7, but the analogy remains quite accurate. The XAML is very close to Silverlight and WPF, and the types of code you can write using C# and VB are very comparable to what you can write today using Silverlight. Please note that using Silverlight today provides the easiest transition to WinRT in the future. Not seamless or trivial, but practical. In addiiton, WPF can enable a WinRT transition too – especially if you limit your use of WPF and .NET to the Silverlight subset of behaviors and features. Microsoft has made much of the HTML 5 technology stack for building WinRT applications. In no way are we talking about web sites, web pages, or web applications here. This is smart client development done using technologies that were previously web-focused. Finally, C++ remains relevant on WinRT as well. This should come as no surprise, given that the Windows OS developers primarily use C++, and there’ll hopefully be games and other applications that are traditionally created using this technology. I also suspect that Objective C apps will port to WinRT more directly through C++ than with C# or js, and (at least for my part) I hope that some of the existing iPad/iPhone apps quickly make their way onto WinRT so I can enjoy them.